~ This page looks best when viewed in full-screen ~ These are my affiliates. They’re the people who not only share an interest of Nerf with me, but they also host either a blog or YouTube channel (or both) dedicated to the game. They often help me come up with ideas and give helpful peer reviews before I publish my works. I view them all as my partners and friends, and I’m proud to support them here. 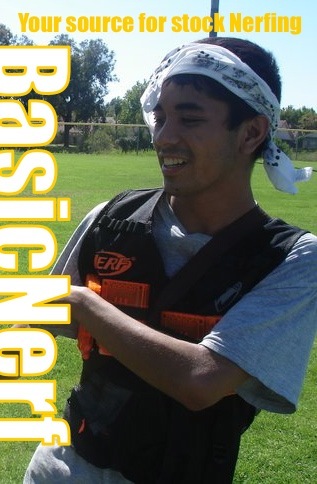 BasicNerf Jason is a Californian Nerfer who scours the internet for the latest Nerf news. He covers everything from “foam films”, which are skits showing action sequences using Nerf weaponry, to official releases, to events sponsored by Nerf itself (such as the annual Dart Tag Championship or the Vortex release party). He’s officially recognized by Nerf and is allowed hands-on coverage of products before their release date. He also helps budding bloggers and YouTubers get their footing by promoting them on many social media sites. I consider Jason my personal partner in the hobby. Visit the BasicNerfing blog here. And the YouTube channel to match. Visit the AFON blog here. And their YouTube channel here. AdultFansOfNerf Somewhere in a secret bunker beneath the surface of the Southwest lies AFON. Brought to you by Mr. K. (Matt) and Mr. S (Travis), you get to see the evolution of Nerf. These guys cover hundreds of blasters, and rather than reviewing each one individually, they view whole series at once. From the very first Nerf blasters like the Blast-a-Ball up through the most recent Elite series, they cover it all. They are also officially recognized by Nerf. 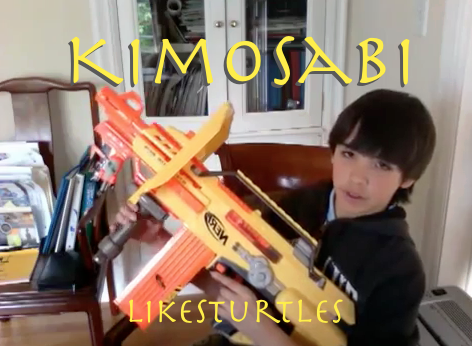 KimosabiLikesTurtles Coming in as the most adorable of my affiliates is Kimosabi, a budding Nerfer who takes pride in tweaking blaster performance. He has an extensive collection of blasters which he reviews both in stock and modded forms via his YouTube channel. He even has a series called “Nerf Tips & Tricks” where he shows nice combinations of Nerf accessories, usage tips, and presents little known facts about each blaster. I’m expecting him to grow, so check him out and show ‘im some love! Our buddy Link from Tasmania has a blog that specializes in pictures. He gives in depth coverage of the looks and “coolness” of each blaster. He also gives reviews and delves a bit into upcoming news and rumors. Go check out the S.O.F.T. blog here. Outback Nerf is a group of three guys who come up with great advice pertaining to all sorts of Nerf-related topics. Cheese, Nerffan (both Australia based) and Milez (Massachusetts, U.S.A. based) give written reviews, starter advice, great ideas for accessory combinations, and even keep up a list showing where in Australia you can find what blaster. Great site, go check Outback out to find a very informative read. Next up is Johnson Arms, in my opinion one of the coolest members of the Nerf Nation. This guy is freakin’ awesome! He uses Nerf (and other brand) blasters as bases, and then supes them up into sci-fi, military, and futuristic styled custom blasters that still fire. His works have even been used as movie props before, and his art is even up for sale to whoever asks. Also, he’ll make you a one-of-a-kind blaster that suits your specific likes. So check him out often and see his constantly evolving stock of glorious custom blasters. Vas the Stampede over at Foam From Above not only covers the latest Nerf news, but a whole assortment of toys, gadgets and gizmos. He travels to toy fairs and gets hands on looks at all the latest gear well before it’s released, and he makes sure you get the inside scoop too. Vas is officially recognized and sponsored by Nerf. His site is definitely worth a look, so check out Foam From Above here. Check out ClickClickBAMFs YouTube channel here. And their blog here. 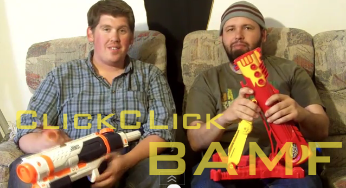 Cooper and Chris at Click Click BAMF settle the score between Nerf and rival companies. They demonstrate head to head comparisons, giving in-depth coverage over each blaster and even create detailed data maps for blaster ranges. They are also officially recognized by Nerf. Nerf Castle is definitely for the modders out there. This site focuses on improving blaster performance, along with giving reviews and keeping up to date on the latest Nerf news. Commissions are also sometimes available. Give Castle a check every once in a while if you like tinkering with your blaster’s internals. Another of the younger affiliates is AwesomelyNerf. Run by a very cool guy named Qi in Singapore, AwesomelyNerf is a great site for Nerf news from the other side of the world. Want to know what’s going down in Singapore? Hit up AweseomlyNerf and get the scoop. If you’d like affiliation, send me a message either through this blog or one of the contact methods mentioned in the “about” section (on the left). In order to qualify you just have to show that you produce original content in an effort to connect and inform the Nerfing community. No ripping other people’s hard work off their site and calling it your own. Don’t worry if you’re small or just starting out, I’m after the quality of your works, not the quantity of your views. The door’s open, so come on and join the nation! Cheese! You mean P13c30fch33s3 right?